I pondered why the moment had stopped so many casual passersby in their tracks. Perhaps it’s because it reminded us of our own love story, or perhaps for others, one that’s still waiting to be written. On that Saturday afternoon it also epitomized to us the magic and serendipitous moments that slow travel provides when you’re least looking for them. 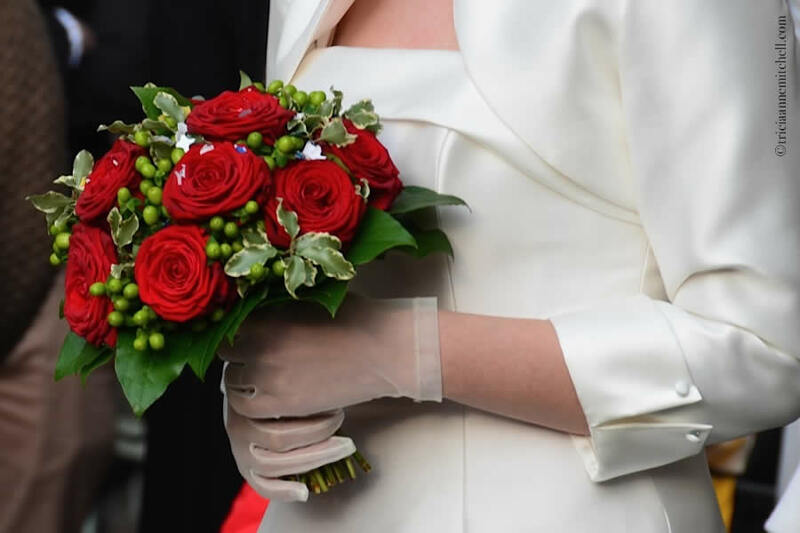 Congratulazioni agli sposi – Congratulations to the newlyweds! 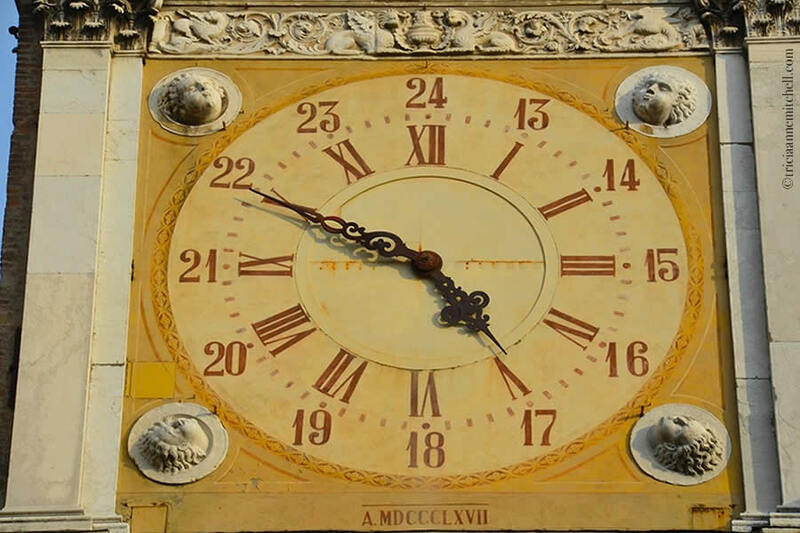 The clock face of Modena’s Town Hall, or Palazzo Comunale, bathed in golden-hour sunlight. A trio of musicians performs for the bridal couple atop a slab of pink marble known as the Preda Ringadora. It’s been in Modena’s main square since at least the 13th Century and it’s served diverse purposes – everything from being a podium, to a place to carry out public punishments, to a venue for displaying corpses for identification. Behind the performers is the city’s famous 14th Century cathedral, the Duomo di Modena, which is shrouded in scaffolding. Peruse the Emilia-Romagna Tourist Board website for more details about Modena’s and the region’s rich offerings. The tourist board just recently released a free e-book that chronicles Emilia-Romagna’s Art Cities. I wish it’d been published when we were in the region, yet it’s since presented even more excuses to return to this stunning part of Italy. We spent 3 nights at the elegant, historic, and centrally-located Hotel Canalgrande. One of our favorite memories from Modena, in fact, was sitting out on our hotel room balcony just before sunset, looking out over Modena’s rooftops, while enjoying goodies that we’d procured at the Albinelli Market earlier in the day. If you’d also like to “eat, feel and live local in Italy” as we did in Modena, check out the BlogVille project website. Our Modena visit was supported by the Emilia-Romagna Tourist Board, to which we extend thanks. An extra special thank you to Nick and Francesca for coordinating all the details and making us feel so welcome in Emilia-Romagna. How utterly romantic .. completely wonderful. I loved the idea of people spontaneously singing to the wedding couple. It was one of those wonderful, spontaneous moments that helps to define a trip, Virginia. Wish you a Happy May Day! images full of joy!! Happy first of May to you Tricia. I am curious if experienced any Maibaum dance today in Oberammergau. Send you tons of sun, which is what apparently your climate needs , right now. Thank you for the springtime greetings, Cornelia. On May Day we had best-laid plans to journey to Farchant for the Maibaum celebration. The day started out with grey clouds, and so we stayed in Oberammergau. It ended up later being a splendid day, which allowed us to take a stroll with my parents’ dog, Gigi, and recharge our batteries, which is what we needed. Love the Fiat there, it’s so Italian. This Fiat was my first car when I was 21 years young and I loved it, now it is becoming fashion again, even her in the U.S. in California. Cornelia, ah, what a charming set of wheels. :) What color was your Fiat? Thank you very much for the post! “Can’t help falling in love” was sung by the University Choir; before my marriage, I used to sing in it and this was their wedding gift.. The trio is my youngest brother’s band; even if they don’t know my friends, they have the some idea, becouse they know I love music.. It was so touching and charming! The car is FIAT 500, it was build in 1964 and it’s a vintage car! Red and white were its original colours and it’s a rarity, even in Italy!!! Benedetta, it’s lovely to hear from you here, and Shawn and I thank you and Daniele for sharing your special day with the Modena passersby. :) It was a beautiful moment that brought a smile to our faces, and a tear to my eye. 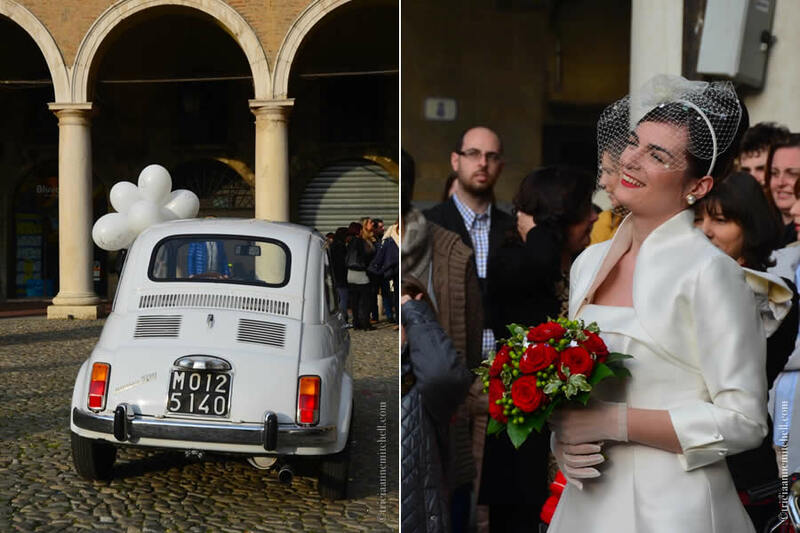 First, we saw the Fiat parked on the piazza, and we said, “let’s wait and see the wedding couple drive away.” We didn’t wait to see you escape in the car, but loved the choir’s serenade, and the music your brother’s band played. It’s even more fun now knowing the symbolism behind the music and the Fiat. Thank you for sharing those details. We wish you all the best, and send our warmest congratulations! I love romantic stories and that is cool! You sure have a good way with words. What a great compliment with which to start the day. Thank you, Gerard! Certainly, touching moments like this one make the words come more easily. I certainly enjoyed hearing from the bride after doing this post! We met her husband for a few seconds out there on the piazza – just long enough to swap email addresses. I was happy to contribute a few more pictures to what their friends and family have probably already shared. I also loved hearing her tidbits about the wedding. Wow, how lucky to have seen Modena in the way you did… The first shot you have in this post is fabulous, it it a classic. Such a happy post! Randall, glad you enjoyed the set. Isn’t that Fiat a charmer? It’s what initially drew us in to this moment. We were hoping to see the couple drive off into the sunset, but as we were waiting for that, instead got to hear as the bride was serenaded by her university choir. We didn’t get a chance to meet the bride that day, but she’s since touched base to mention the vintage of the car, etc., mentioning that it’s a rarity, even in Italy. When you make that grand Croatian trip, perhaps you can also ferry over to Italy, as we did. Modena’s region, Emilia-Romagna, doesn’t disappoint with its incredible food, friendly people, and quiet elegance. That reminds me of Florence, the light, the arches , the duomo. I have a photograph of a car exactly the same as that taken on a trip to Montecarlo, near Lucca. They’ve obviously become Italian treasures. Dorothy, I can see where you noticed similarities between the two cities’ architecture. Regarding the car, the bride since wrote to give me the specs of this car, and apparently the subject of your photo too. It’s a 1964 Fiat 500, and was red and white in its former life. She mentioned that it’s rare – even in Italy. :) Guess we were both lucky to photograph them during our travels to Italy. Montecarlo and Lucca both look delightful. Someday I’d love to spent months, even years, traversing Italy and properly exploring the country. We always seem to see weddings when we travel in Europe. I think they are much more public than here. It’s always a joy to see two people starting out on a new life together, even when we don’t know them. I think that’s the reason. And we’ve seen them on all days of the week too, whereas here weddings are usually on Saturdays. Did you read on Justin Beaver’s blog where he gatecrashed a wedding in Cologne? Carol, no, I hadn’t heard about your alter ego’s mischievous antics. :) Looks as though you all had a fun time in Cologne! We did. I really enjoyed Cologne, particularly all the Roman remains. Justin Beaver enjoyed all the food, as usual. Beautiful! I love the confetti tradition! Susan, it does add character to a wedding! 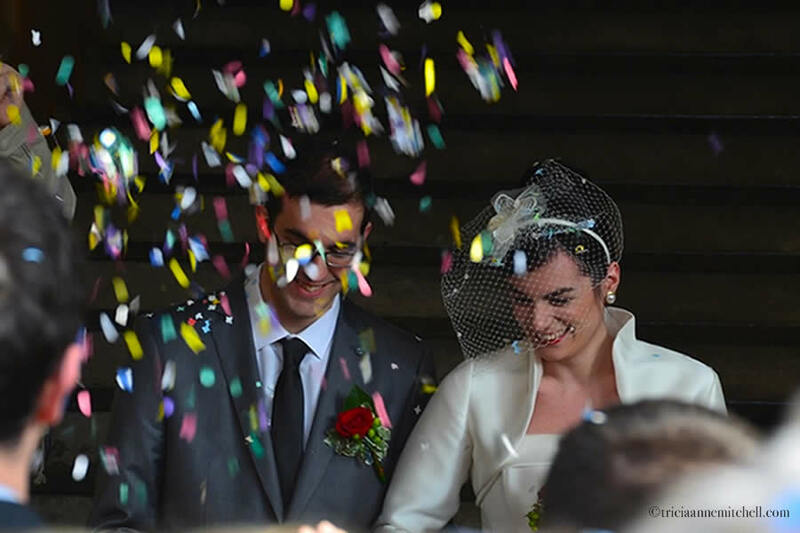 I loved that the bride later wrote to explain that confetti’s Italian name is called coriander or coriandoli. :) Do you know if there is supposed to be a linguistic connection with the herb? What a lovely post! We have never been able to attend a Christian wedding….Hopefully….someday! Sonia, it was a sweet moment, and I’m happy we arrived in the piazza just at the right time. When we were in India, we were hoping to attend a traditional wedding too. Certainly an excuse to return!